The Horizon Basketball Glass Trophy is made from premium jade toned 5mm thick clear glass with bevelled edges and stands on a small glass base. The trophy has a bold orange basketball with groove detailing emerging from the front of the award. Cut from high grade glass with a decorative chipped edge finish, the Curling Glass Plaque displays a two toned gold curling motif. A pair of curling stones are set against a target backdrop on a shield and a banner with the word CURLING. The glass plaque stands on a flat glass base. The antique gold shield motif of the Slimming Glass Plaque Award displays a beautiful apple wrapped in a tape measure. Perfect for recognising the achievements of a well deserving slimmer. The elegant glass plaque is cute from quality glass decorated with chipped edges. The Hope Flame Glass Award is a high quality 5mm thick glass award shaped like a flame. 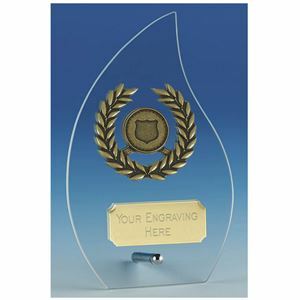 Available in 3 sizes, this premium clear glass award holds a laurel wreath with shield shaped centre. The centre can remain as displayed or be covered with an optional logo or image insert, for that personal touch. The Hope Flame Glass Award stands on a narrow silver pin stand. The trophy has a vivid yellow tennis ball with groove detailing emerging from the front of the award. The Horizon Tennis Glass Trophy is made from premium jade toned 5mm thick clear glass. The plaque has bevelled edges and stands on a small rectangular glass base. The Maverick Legacy Glass Ice Hockey Trophy features a two toned bronze plastic motif with an ice hockey helmet, sticks and goal net set onto a crystal plaque. 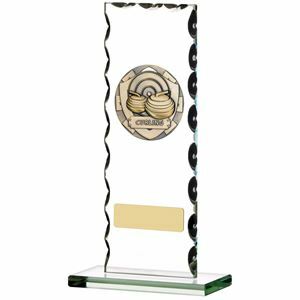 The trophy is made premium 5mm thick jade toned clear glass which has a rainbow etched finish. 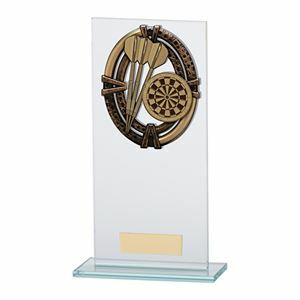 This netball trophy is made from a 5mm thick premium clear jade toned glass with bevelled edges. 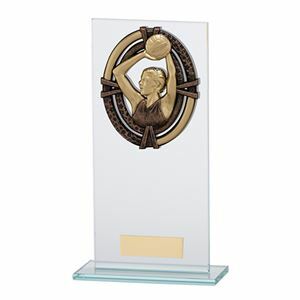 The Maverick Legacy Glass Netball Trophy has an action netball player and her ball on a two toned bronze insignia and is made from quality lacquered plastic. 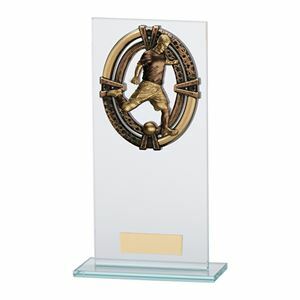 The Maverick Legacy Glass Football Player Trophy features a gold and bronze coloured plastic motif with an action footballer player and his ball. The premium crystal plaque is made of 5mm thick clear jade toned glass with bevelled edges. The Maverick Legacy Glass Football Trophy is made from premium 5mm thick jade clear glass and has a rainbow etch finish. 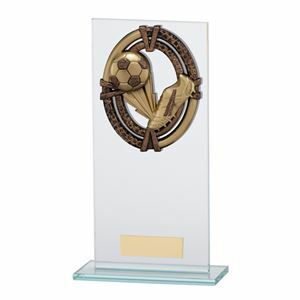 The crystal plaque features a two toned glazed bronze coloured plastic insignia with a football and boot. The crystal plaque features a dartboard and three darts on a two toned bronze coloured plastic shield. The premium Maverick Legacy Glass Darts Trophy is made from 5mm thick jade clear glass with a rainbow etch finish. The premium crystal plaque is made from 5mm clear jade glass and has bevelled edges. The Maverick Legacy Glass Clay Pigeon Trophy features a silver, gold and bronze coloured plastic shield with gun, clay and cartridges.